VXC800: Premiere for the world’s first continuous 3D printer – Ying Feng Precision Machinery Co., Ltd.
With an innovative concept study of the world’s first continuous 3D printer, voxeljet garnered considerable attention at GIFA 2011 – and elicited an outstanding response from the expert audience. Now, the Augsburg-based equipment builder is presenting the brand new VXC800, a 3D continuous printer that has been developed to series production readiness. The machine will celebrate its premiere at EuroMold 2012. “Our presentation of the concept study was so well received that we decided on a rapid implementation of the project. Our development team worked at full speed for an entire year. The result is the VXC800 – the world’s first continuous 3D printer that lays the foundation for a completely new generation of equipment. 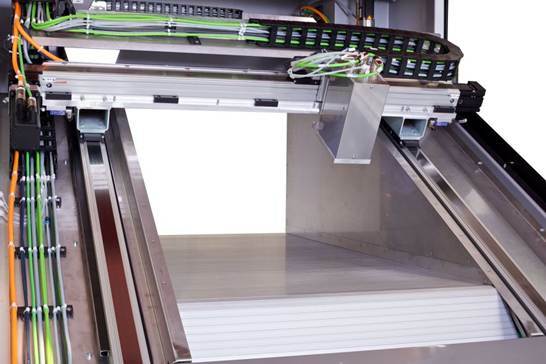 The building and unpacking process steps now run in parallel, without a need to interrupt the operations of the system – an absolute novelty for the industry,” says Dr. Ingo Ederer, CEO of voxeljet technology. The advantages of this unique concept are clear: The innovative system design allows for hitherto unprecedented performance and flexibility. While the printing process is active on one side of the system, unpacking can take place simultaneously on the other side. All of this can be done without interrupting operations. In particular, it raises the patternless small series production of moulds and models for metal casting based on CAD data to a higher level of speed, profitability and flexibility. This leap in technology has become possible thanks to a novel patented design with a horizontal belt conveyor that controls the layer building. The layers are built at the entrance of the belt conveyor, while the unpacking takes place at the exit. The VXC800 has made the build containers common in conventional additive processes a thing of the past. The core of the process is the printing, which is done on a level tilted to the horizontal. The printing process is similar to conventional 3D printing. First the coater generates a layer of powder. This layer is at an angle to the horizontal that is smaller than the repose angle of the powder. A high-definition 600 dpi resolution print head then selectively bonds the layers. The conveyor system moves the entire fill toward the unpacking area by one layer thickness. The finished component can simply be removed from the rear end of the system when it has gone through the entire material. Compared to the concept study, the build space of the series machine has been significantly enlarged and now measures 850 x 500 mm in width and height. The length of the moulds is virtually unlimited with this type of system, as there are no restrictions with respect to the length of the belt conveyor. The usable build length is limited only by the manageability of the moulds. The tilt of the print level enables the print head to take far less time for positioning movements, which improves the print speed. The system technology also offers additional benefits. Apart from the technological highlights, users will be pleased with the investment and operating costs, which are lower than those of conventional systems. The continuous printer does away with build containers and a separate unpacking station, resulting in lower acquisition costs. The printer also scores points with the high re-use rate for unprinted particle material, which is returned straight to the build zone from the unpacking area. Consequently, the machine requires smaller filling quantities and incurs lower set-up costs. Similar to conventional 3D printers, the VXC800 also uses proven voxeljet print technology, which stands for top quality and precision. 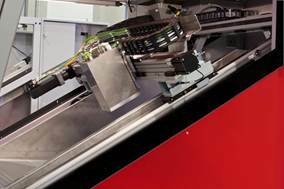 The machine works with layer thicknesses ranging from 150 µm to 400 µm. “The development of the world’s first 3D continuous printer is a milestone not just for voxeljet but the entire industry. 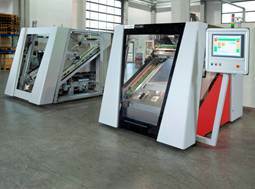 Orders for the machine can be placed as of the start of the EuroMold. The first deliveries are planned for the second quarter of 2013,” says Dr. Ederer.